High speed is a buzzword these days, but not all high-speeds are created equal. Block processing time of 25 microseconds (Pentium 300 MHz). 80 smart look-ahead buffers, give the control ample time to decelerate automatically before sharp corners or slower feedrate blocks. Jerk-factor makes any contour smoother. Feed override up to 200% functions even with high speed. All internal motion calculations are performed in 1 nanometer resolution (ultra-high-precision nano interpolation). Version 5 supports program size of 3-4 million lines; version 6 is limited by disk size only. 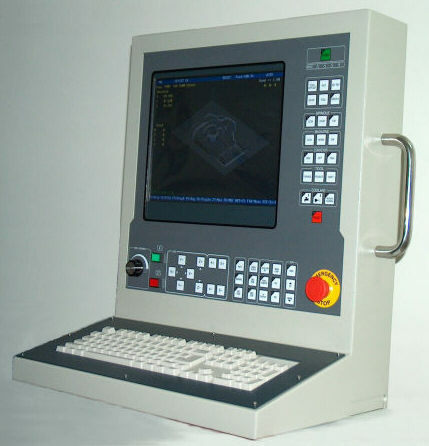 For 3-axis machine, virtual W looks like a 4th axis. Using it moves Z of course. This lets you raise or lower the tool manually the same as with actual W, and even while the machine cuts, by the handwheel (MPG). A few simple steps let you Start from the Middle, and no access to the program is needed. You can seek a line in the program or the current position of the tool. You are in full control while NCPlus guides you thru the sequence; nothing is going to move by itself. 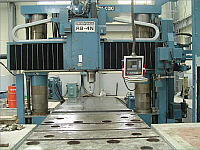 Rigid tapping is available for machines with servo spindle. NCPlus does rigid tapping by interpolating Z with the spindle. This is done digitally and doesn't require any periodic adjustment. The pitch is programmed rather than feed-RPM combination. TCP mode works in Auto as well as in Manual, with tool length compensation. Jogging and MPG both move in tool coordinates, so releasing a broken drill is not a problem. Pivot length and misalignments are compensated automatically. Feed is programmed in IPM or mm/min same as in a three-axis machine. 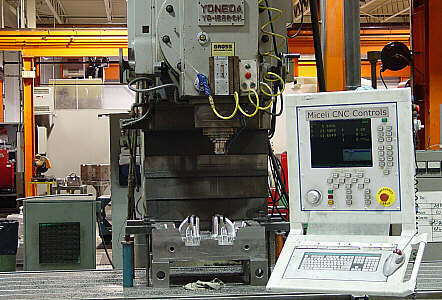 Standard drilling canned cycles work for any tool orientation. This compensation can be used with 3D contouring if your post-processor generates IJK vector in addition to XYZ. It also works with 5-axis profiling. Off line on a desktop or laptop. Standard G and M codes. Math mixed with NC data. Built-in menu generator and data entry to create conversational programs. Extensive macro/scripting language, lets you exploit the computer's processing power and add your own touch. Hardware can be added or upgraded. All components are commercially available from multi-sources.